More than half of our primary energy resources are used to generate heat. Therefore, technologies for increasing the share of sustainable heat sources and for improving the efficiency of thermal systems are of key importance. Thermal energy storage technologies are needed for both – to match the intermittent supply of sustainable heat and cold and to optimize the thermal system performance. Present thermal energy storage technologies based on water perform well, but on a relatively low level of efficiency, particularly for longterm storage. These systems can only be improved marginally thus new materials and systems are needed to enable a breakthrough. A tremendous increase in the market for air-conditioning can be observed worldwide especially in developing countries. 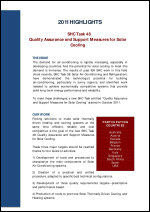 The results of the past IEA SHC Tasks and work on solar cooling in SHC Task 38: Solar Air-Conditioning and Refrigeration show the large potential of this technology for building air-conditioning, particularly in sunny regions. However, solar thermal cooling faces barriers to emerge as an economically competitive solution. Thus there is a strong need to stimulate the solar cooling sector for small and medium sized systems. In the residential sector, solar thermal and PV systems are typically placed on building roofs with limited attempts to incorporate them into the building envelope thus creating aesthetic drawbacks and space availability problems. On the contrary, the use of facades is highly unexplored, and daylight control is delegated to individual management of blinds and curtains leading to high thermal loads during mid-seasons and summer. In the tertiary segment (offices, schools, hospitals), the roof is again, most of the time, the only surface devoted to the installation of solar thermal and PV technologies. While daylight control here is state of the art in terms of shading effect, the utilization of shading devices to redirect natural light into the room thus improving visual comfort still needs further work. When energy efficient technologies are installed together with traditional ones, frequently they are just “added on top” of the main systems, resulting in high investment costs and lowperformance optimization. An interesting option to overcome this competition is to combine multiple functions in envelope components thus enabling hybrid systems to simultaneously cover different energy, comfort and aesthetic needs. 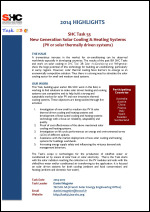 A solar PV/Thermal (PVT) collector produces both heat and electricity. 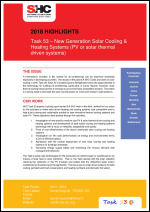 Two recent developments in the heating industry are opening the door for PVT applications. 1. The strong and increasing interest in Building Integrated PV (BIPV) and Façade Integrated PV (FIPV) not only in office and industrial buildings, but also in residential buildings where electricity and heating and sometimes cooling is required. 2. The developments in heat pump technology create more possibilities to make use of the low exergy heat source of uncovered PVT collectors and reduce the energy cost for the user and the need for borehole storage. 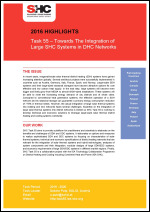 The HVAC industry, however, is not fully aware of the possibilities and benefits of PVT solutions, and international standards are lacking, which creates less confidence for the final PVT customer. The change to a sustainable, resource- and energy-efficient industry represents a major challenge in the coming years. The efficient supply of energy, the best possible integration of renewable energy sources and the recovery of resources in the sense of the circular economy must go hand in hand. The use of solar process heat represents a large, but so far mostly unused, potential in industry. 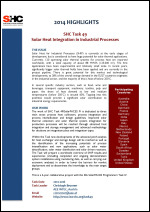 The 4th Task 55 Expert Meeting, the SHD DHC Joined Workshop and lates project results are highlihted within the Task 55 Trends Statement in April 2018. The main objective of SHC Task 51 is to provide support to urban planners, authorities and architects to achieve urban areas, and eventually whole cities, with architecturally integrated solar energy solutions (active and passive) that contribute a large fraction of the renewable energy supply in cities. 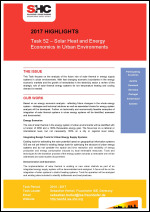 Results include processes, methods and tools to assist cities with developing a long-term urban energy strategy. Heritage and aesthetic issues and solar fields in sensitive landscapes have also been studied. Additionally, a goal is to prepare for and strengthen solar energy in urban planning education at universities. The material developed will also be useful for post-graduate courses and continuing professional development (CPD). Based on an energy economic analysis - reflecting future changes in the whole energy system - strategies and technical solutions as well as associated chains for energy system analysis will be developed. 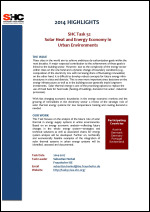 Further on technically and economically feasible examples of integration of solar thermal systems in urban energy systems will be identified, assessed and documented. 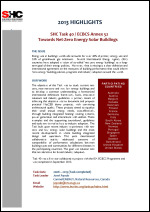 SHC Task 56 focuses on simulation, laboratory tests and monitoring of multifunctional envelope systems that use and/or control solar energy, influencing thermal energy demand, thermal energy consumption and comfort of the building. 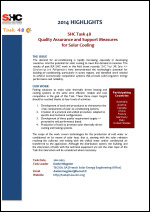 When manufacturers of solar thermal products – for example, solar collectors – enter new markets they often need to do re-testing of their products and to have a re-inspection of their production facilities. This is needed in order to obtain local certification and have access to these new markets. To avoid this waste of time and money, international standards for testing are being developed and promoted and a network of professionals has been established with the aim to harmonize certification requirements at the “global level”. More than half of our primary energy resources are used to generate heat. Therefore, technologies for increasing the share of sustainable heat sources and for improving the efficiency of thermal systems are of key importance. 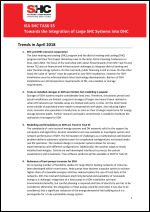 Thermal energy storage technologies are needed for both – to match the intermittent supply of sustainable heat and cold and to optimize the thermal system performance. Present thermal energy storage technologies based on water perform well, but on a relatively low level of efficiency, particularly for long-term storage. These systems can only be improved marginally thus new materials and systems are needed to enable a breakthrough.More than half of our primary energy resources are used to generate heat. Therefore, technologies for increasing the share of sustainable heat sources and for improving the efficiency of thermal systems are of key importance. 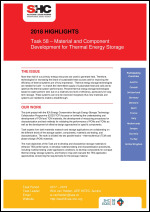 Thermal energy storage technologies are needed for both – to match the intermittent supply of sustainable heat and cold and to optimize the thermal system performance. Present thermal energy storage technologies based on water perform well, but on a relatively low level of efficiency, particularly for long-term storage. These systems can only be improved marginally thus new materials and systems are needed to enable a breakthrough. 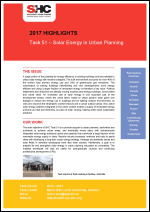 A report on the state-of-the-art in education regarding urban planning with solar energy will be published in early 2017. 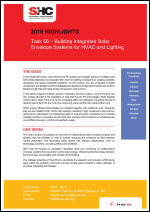 The main conclusion from this work is that there are many courses dealing with solar energy, but most of these courses are in engineering and architecture programs and focus on the technical aspects of solar energy, such as materials, system components and the construction of solar systems. In urban design and urban planning programs there are only few courses dealing with this topic. Thus, a huge gap is detected in urban planning education. 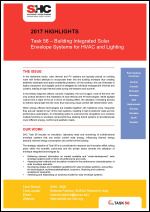 A complementary report is drafted that covers the state-of-the-art on solar tools in education. The review of existing urban planning legislation and voluntary initiatives and of existing urban planning processes in participating countries is now compiled and will be prepared for the SHC review process. A detailed analysis for the Austrian, Danish, German and Italian situation was done looking for different scenarios for the year 2050. For different shares of district heating and installed photovoltaic capacity potentials for solar heat were calculated using the techno-economic model EnergyPLAN. The results show that the overall share has a potential of 5-8% of the total heat demand. SHC Task 53, building upon earlier IEA SHC work in this field, is working to find solutions to make solar driven heating and cooling systems cost competitive and to help build a strong and sustainable market for new innovative thermal cooling systems and solar PV. 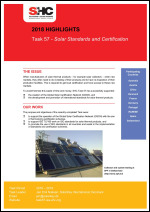 SHC Task 54 aims to reduce the purchase price for end-users of installed solar thermal systems by evaluating and developing sustainable means to reduce the production and/or installation costs of materials, sub-components and system components. Special emphasis is being placed on the identification and reduction of post-production cost drivers (e.g., channels of distribution). 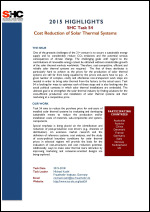 An extensive market research, the definition of reference systems, cost analyses and the study of socio-political boundary conditions for solar thermal prices in selected regions will provide the basis for the evaluation of cost structures and cost reduction potential. Additionally, ways to make solar thermal more attractive by improving marketing and consumer-oriented designs are being explored. 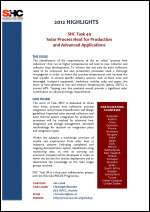 Knowledge of solar energy resources is critical when designing, financing, and operating successful solar water heating systems, concentrating solar power systems, and photovoltaic systems. However, due to their dependence on weather phenomena the energy output from these technologies can be highly variable, especially in situations where storage is not available to smooth out this variability. 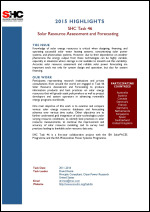 Accurate solar resource assessment and reliable solar power forecasting are important tools not only for system design and operation, but also for system financing. Performance test procedures and characterization equations were originally developed for typical solar collector types under well-defined standard test conditions. In addition, short-term tests were developed to predict the long-term durability of standard collectors and systems. 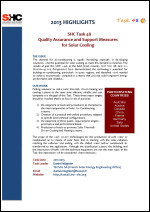 Presently, national and international test laboratories in many IEA participant countries use these test procedures and characterization equations in order to determine a solar thermal product's performance and compliance with required safety and reliability standards. While there is a solid common foundation for most test procedures, certification bodies for Europe, North America, Australia, China and Europe and the laboratories that they work with have diverged in how tests are implemented in some areas, and the introduction of new products have introduced new challenges that are not always addressed in the same way. The demand for air-conditioning is rapidly increasing, especially in developing countries. And the potential for solar cooling to meet this demand is immense. The results of past IEA SHC work in this field (most recently, SHC Task 38: Solar Air-Conditioning and Refrigeration) have demonstrated the technology’s potential for building air-conditioning, particularly in sunny regions, and identified work needed to achieve economically competitive systems that provide solid long-term energy performance and reliability. 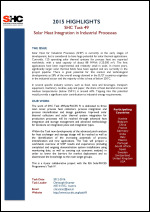 Solar Heat for Industrial Processes (SHIP) is currently at the early stages of development, but is considered to have huge potential for solar thermal applications. Currently, 120 operating solar thermal systems for process heat are reported worldwide, with a total capacity of about 88 MWth (125,000 m2). The first applications have been experimental and relatively small in scale. In recent years, significantly larger solar thermal fields have been applied and are currently in the project pipeline. There is great potential for this market and technological developments as 28% of the overall energy demand in the EU27 countries originates in the industrial sector and the majority of this is heat of below 250°C. Lighting accounts for approximately 19% (~3000 TWh) of global electric energy consumption. Without essential changes in policies, markets and practical implementations, it is expected to continuously grow despite significant and rapid technical improvements like solid-state lighting, new façades and light management techniques. 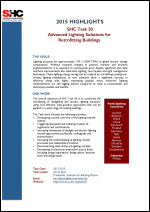 Major lighting energy savings can be realized by retrofitting existing out-of-date lighting installations, as new solutions allow a significant increase in efficiency along with highly interesting payback times. However, lighting refurbishments are still lagging behind compared to what is economically and technically possible and feasible. The main objective of SHC Task 51 is to provide support to urban planners, authorities and architects to achieve urban areas, and eventually whole cities, with architecturally integrated solar energy solutions (active and passive) that contribute a large fraction of the renewable energy supply in cities. Results will include processes, methods and tools to assist cities with developing a long-term urban energy strategy. A framework for energy system analysis was set up using different modelling approaches. A detailed analysis for the German situation was done looking for different scenarios for the year 2050. 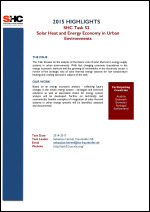 For different shares of district heating and installed photovoltaic capacity potentials for solar heat were calculated using the techno-economic model ReMod-D. First results show that for more or less similar costs for the over-all energy system, solar thermal might play a role when the installed PV-capacity is lower than 200 GW. One of the greatest challenges of the 21st century is to secure a sustainable energy supply and to considerably reduce CO2 emissions and the potential serious consequences of climate change. The challenging goals with regard to the contributions of renewable energy cannot be obtained without considerable growth of the solar thermal markets worldwide. Therefore, cost-competitive, efficient and reliable solar thermal systems are required. The first of these attributes is particularly hard to achieve as the prices for the production of solar thermal systems are still far from being equalled by the prices end-users have to pay. 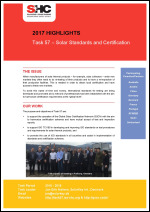 A great number of complex, costly and oftentimes non-transparent work steps are needed in order to bring solar thermal from the factory to the actual users. 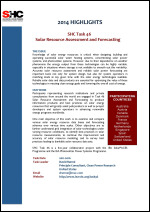 Task 54 is looking for ways to optimize each of these steps and is also looking into the social political contexts in which solar thermal installations are embedded. The ultimate goal is to strengthen the solar thermal industry by finding solutions for the cost-efficient production and installation of solar thermal systems and their marketing at a competitive price. The EU Parliament approved in April 2009 a recommendation that member states have to set intermediate goals for existing buildings as a fixed minimum percentage of buildings to be net zero energy by 2015 and 2020. For the existing non-residential buildings, a dramatic reduction in primary energy consumption is crucial to achieve this goal. A few renovation projects have demonstrated that total primary energy consumption can be drastically reduced together with improvements of the indoor climate. However, most property owners are not even aware that such savings are possible, and they set too conservative energy targets. Buildings renovated to mediocre performance can be a lost opportunity for decades. It is therefore important that building owners are aware of such successes and set ambitious targets. 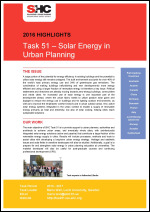 A report on the state-of-the-art in education regarding urban planning with solar energy will be published in 2016. 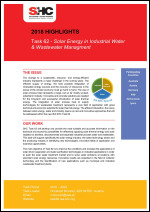 The main conclusion from this work is that there are many courses dealing with solar energy, but most of these courses are in engineering and architecture programs and focus on the technical aspects of solar energy, such as materials, system components and the construction of solar systems. In urban design and urban planning programs there are only few courses dealing with this topic. Thus, a huge gap is detected in urban planning education. Large solar heating and cooling systems are very cost effective in some applications, for example supplying heat to an existing district heating system. The market for “Solar District Heating Systems” is developing fast in northern Europe as well as in China – and has big potential in other places. Use of seasonal storage and heat pumps makes it possible to obtain a high solar fraction (> 50%) and to interact with and level out dynamics in the electricity grid (these dynamics are increasing due to increased supply from wind turbines and PV systems). Solar district heating systems are getting rather large (a 50 MW solar collector field with a 200,000 m3 water pit storage in Denmark will begin operation in the spring of 2015). Knowledge of solar energy resources is critical when designing, building and operating successful solar water heating systems, concentrating solar power systems, and photovoltaic systems. However, due to their dependence on weather phenomena the energy output from these technologies can be highly variable, especially in situations where storage is not available to smooth out this variability. 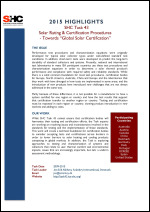 Accurate solar resource assessment and reliable solar power forecasting are important tools not only for system design, but also for system operators in matching loads at any given time with the solar energy technologies available. Reliable solar data and data products are essential for optimizing the value of these technologies in meeting clean energy goals and lowering the overall cost of energy. Solar Heat for Industrial Processes (SHIP) is currently at the early stages of development, but is considered to have huge potential for solar thermal applications. Currently, 120 operating solar thermal systems for process heat are reported worldwide, with a total capacity of about 88 MWth (125,000 m2). The first applications have been experimental and relatively small scale. In recent years, significantly bigger solar thermal fields have been applied and are currently in the project pipeline. There is great potential for this market and technological developments, as 28% of the overall energy demand in the EU27 countries originates in the industrial sector, and the majority of this is heat of below 250°C. In several specific industry sectors, such as food, wine and beverages, transport equipment, machinery, textiles, pulp and paper, the share of heat demand at low and medium temperatures (below 250°C) is around 60%. Tapping into this potential would provide a significant solar contribution to industrial energy requirements. A framework for energy system analysis was set up using different modeling approaches. And, the EnergyPLAN by Aalborg University in Denmark will be used as the Reference Model. One of the greatest challenges of the 21st century is to secure sustainable and save energy supply and to considerably reduce CO2 emissions and the potential serious consequences of climate change. The challenging goals with regard to the contributions of renewable energies cannot be obtained without a considerable growth of the solar thermal markets worldwide. Therefore, reliable, efficient and cost-competitive system components are required in large quantities. Today solar thermal collectors mainly consist of glass and metals whereas especially market prices for metals are subject to big fluctuations. These issues demand the introduction of new materials, of which polymers seem to have a strong preference with regard to mass-production techniques, new design freedom, cost- and weight reduction. Energy use in buildings worldwide accounts for over 40% of primary energy use and 24% of greenhouse gas emissions. Several International Energy Agency (IEA) countries have adopted a vision of so-called ‘net zero energy buildings’ as a longterm goal of their energy policies. However, what is missing is a clear definition and international agreement on the measures of building performance that could inform 'zero energy’ building policies, programs and industry adoption around the world. 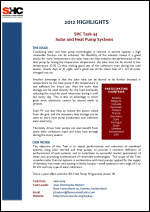 Combining solar and heat pump technologies is relevant in several aspects: a high renewable fraction can be achieved (solar + the heat pump heat source) and the safety of the solution makes it a good choice for many homeowners. 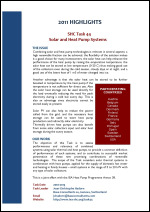 The solar heat can help enhance the performance of the heat pump by raising the evaporation temperature. And the solar heat can be stored at low temperatures (0-80° C) thus making good use of the collectors even during the cold season, cloudy days or at night. A good use of the latent heat of water changed into ice around 0° C can also be achieved. The EU Parliament approved in April 2009 a recommendation that member states have to set intermediate goals for existing buildings as a fixed minimum percentage of buildings to be net zero energy by 2015 and 2020. For the existing non-residential buildings, a dramatic reduction in primary energy consumption is crucial to achieve this goal. A few renovation projects have demonstrated that total primary energy consumption can be drastically reduced together with improvements of the indoor climate. However, most property owners are not even aware that such savings are possible, and they set energy targets that are too conservative. Buildings renovated to mediocre performance can be a lost opportunity for decades. It is therefore important that building owners are aware of such successes and set ambitious targets. The demand for air-conditioning is rapidly increasing, especially in developing countries. And the potential for solar cooling to meet this demand is immense. 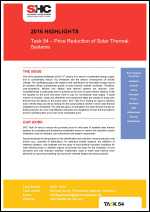 The results of past IEA SHC work in this field (most recently, SHC Task 38: Solar Air- Conditioning and Refrigeration) have demonstrated the technology’s potential for building air-conditioning, particularly in sunny regions, and identified work needed to achieve economically competitive systems that provide solid long-term energy performance and reliability. Lighting accounts for approximately 19% (~3000 TWh) of the global electric energy consumption. Without essential changes in policies, markets and practical implementations, it is expected to continuously grow despite significant and rapid technical improvements like solid-state lighting, new façade and light management techniques. 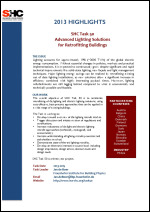 Major lighting energy savings can be realized by retrofitting existing out of date lighting installations, as new solutions allow a significant increase in efficiency combined with highly interesting payback times. However, lighting refurbishments are still lagging behind compared to what is economically and technically possible and feasible. 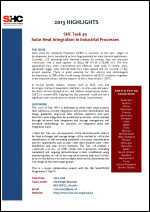 The identification of the requirements of the so called “process heat collectors” that run at higher temperatures will lead to new collector and collector loop developments. To achieve this not only do solar collectors need to be improved, but also production processes need a thorough investigation in order to lower the process temperatures and increase the heat transfer. In several specific industry sectors, such as food, wine and beverages, transport equipment, machinery, textiles, pulp and paper, the share of heat demand at low and medium temperatures (below 250°C) is around 60%. Tapping into this potential would provide a significant solar contribution to industrial energy requirements. Solar Heat for Industrial Processes (SHIP) is currently at the early stages of development, but is considered to have huge potential for solar thermal applications. Currently, 120 operating solar thermal systems for process heat are reported worldwide, with a total capacity of about 88 MWth (125,000 m2). The first applications have been experimental and relatively small scale. In recent years, significantly bigger solar thermal fields have been applied and are currently in the project pipeline. There is great potential for this market and technological developments, as 28% of the overall energy demand in the EU27 countries originates in the industrial sector, and the majority of this is heat of below 250°C. To reach high solar fractions, it is necessary to store heat or cold efficiently for longer periods of time. At this time, there are no cost-effective compact storage technologies available. 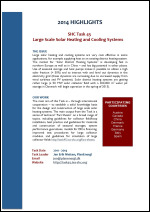 For high solar fraction systems, hot water stores are expensive and require very large volumes of space. Alternative storage technologies, such as phase change materials (PCMs), sorption materials and thermochemical materials (TCMs) are only available at the laboratory scale, and more R&D is needed before they are available commercially. The EU Parliament approved in April 2009 a recommendation that member states have to set intermediate goals for existing buildings as a fixed minimum percentage of buildings to be net zero energy by 2015 and 2020. One of the greatest challenges of the 21st century is to secure sustainable and save energy supply and to considerably reduce CO2 emissions and the potential serious consequences of climate change. The challenging goals with regard to the contributions of renewable energies cannot be obtained without a considerable growth of the solar thermal markets worldwide. Therefore, reliable, efficient and cost-competitive system components are required in large quantities. Today solar thermal collectors mainly consist of glass and metals whereas especially market prices for metals are subject to big fluctuations. Energy use in buildings worldwide accounts for over 40% of primary energy use and 24% of greenhouse gas emissions. Several International Energy Agency (IEA) countries have adopted a vision of so-called ‘net zero energy buildings’ as a long-term goal of their energy policies. However, what is missing is a clear definition and international agreement on the measures of building performance that could inform ‘zero energy’ building policies, programs and industry adoption around the world. Our vision - and the opportunity - is to make architectural design a driving force for the use of solar energy. Solar energy use can be an important part of the building design and the building's energy balance to a much higher extent than it is today. The development towards zero energy buildings will cause a more frequent use of building integrated solar energy systems. Due to the large size of such systems in relation to the scale of the building envelope, the architectural quality of their integration has a major impact on the final architectural quality of the building. Many solar systems do exist on the market, and with better and better energy performance. But, if they are not designed to be integrated into buildings in an appealing way, probably no building permit will be given, at least not in urban areas. And then – what is the use of a highly efficient collector if it will not be used? 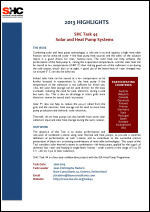 Combining solar and heat pump technologies is relevant in several aspects: a high renewable fraction can be achieved, the flexibility of the solution makes it a good choice for many homeowners, the solar heat can help enhance the performance of the heat pump by raising the evaporation temperature, the solar heat can be stored at low temperature (0-20 C) thus making good use of the collectors even during the cold season, cloudy days or at night, and a good use of the latent heat of 1 m3 of water changed into ice. Knowledge of solar energy resources is critical when designing, building and operating successful solar water heating systems, concentrating solar power systems, and photovoltaic systems. However, due to their dependence on weather phenomena the energy output from these technologies can be highly variable, especially in situations where storage is not available to smooth out this variability. High penetrations of these technologies will then require utilities to be able to predict their availability to meet varying load demands. Solar resource and solar power forecasting is an important tool being made available to system operators to assist them in matching load fluctuations with the solar energy technologies available to them, thereby optimizing the value of these technologies in meeting clean energy goals.